Expert assessment is a fundamental part of the evaluation of the mutagenic potential of impurities under the ICH M7 guideline1, which makes a specific provision for the application of expert knowledge to support or overturn a (Q)SAR prediction. Lhasa Limited provides ICH M7 solutions aimed to offer guidance and support as part of a wider expert review. Chris Barber et al.2 have outlined their views on establishing best practice in the application of expert review under ICH M7. But what constitutes a positive or negative prediction for bacterial mutagenicity within Lhasa Limited products and how should conflicting results be interpreted? Derek and Sarah can be run from within the same Nexus interface to simplify your workflow; however, it is important to remember that they are separate systems, providing completely independent predictions and reports. As such, there are times when these results will contradict each other. In the case that results are contradicting, an expert review of all available data should be carried out to come to a logical conclusion. Expert review is very important and as such, Lhasa has worked hard to ensure that both Derek and Sarah Nexus provide the right level of information to support an expert analysis, allowing you to come to an informed decision. 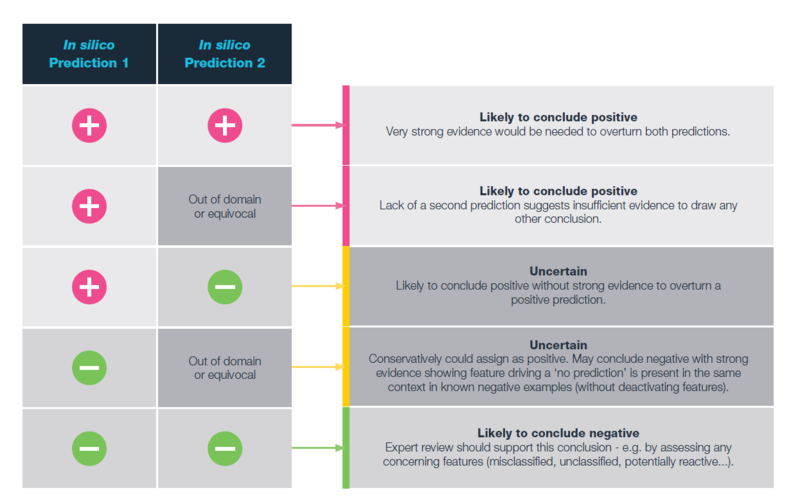 The Lhasa ICH M7 decision matrix2 provides an overview of the likely outcome based your two predictions. However, expert review and additional information can lead to a different expert call. ICH M7 requires the use of two complementary methodologies (one expert rule-based and the other statistical-based). This exercise uses Derek Nexus which fulfils the requirements of the expert rule-based methodology and Sarah Nexus which fulfils the requirements of the statistical-based methodology. For the purpose of this exercise it is assumed that the example compounds do not have any known mutagenicity data (where such data does exists it is ignored). As such all assessments have been made using only the predictions from Derek Nexus and Sarah Nexus, the supporting information they provide and data from similar compounds where applicable (read across). All expert calls made on the examples are solely the opinion of experts at Lhasa Limited and are made here for guidance purposes only. These examples were carried out using Nexus 2.1.